THE WRITING BUDDHA - Opinions | Books | Movies: Everyone has a story by Savi Sharma (Book Review- 1*/5) !!! 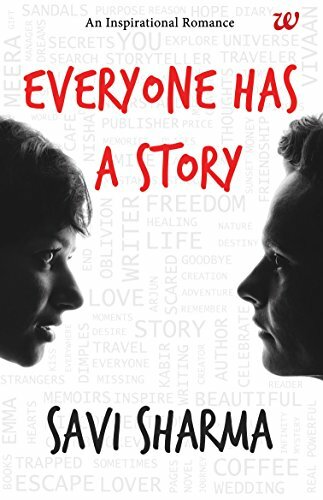 Everyone has a story by Savi Sharma (Book Review- 1*/5) !!! I recently picked up "Everyone has a story" which is written by debutante, Savi Sharma. The book is published by well-known Westland Publication. The main attraction towards the book was the extreme promotions that the writer have done on Amazon and everywhere else. The book has also landed up in the Top 10 Nielson Bestseller list. But after reading t his book in 1.5 hours, I can say that it's one of the mediocre books that Indian debut authors write. It has nothing that can move you or make you think about the characters and their feelings. The book lacks soul which has played negative for it. When the tagline says "An Inspirational Romance", you expect a lot from that book because not every book claims to be that different and out-of-the-box. The cover page has many mono-syllables and words printed on it which makes the book look more special and distinct. Unfortunately, the book seems to be written just for the sake of writing something that can be published in the form of a novel and sold in the market. Otherwise, everything that the author tries to say, she herself leaves the topic in between and move on to some other topic. It seems as if author is not confident herself about keeping the reader interested and engrossed in that particular topic that the characters are discussing because of which she just ends it abruptly and something else begins which can be called as love story which has everything except romance. When one of the character is introduced as traveler and later on his traveling journey is discussed, you expect something incredible and exciting from that chapter as the character moves out of India but the narration is so weak and plain that you are unable to feel anything out of it. That main section itself fails the book. Overall, I would say that the book needed little more detailing either from point of view of characters or situations or love story. This seems to be an incomplete book and written just for the sake of writing. I give this book 1 star out of 5. Soulless!